Today Ron Cervi, a flying traffic and news reporter for KCBS, released a picture on his Twitter page of the campus site which was taken from the air. 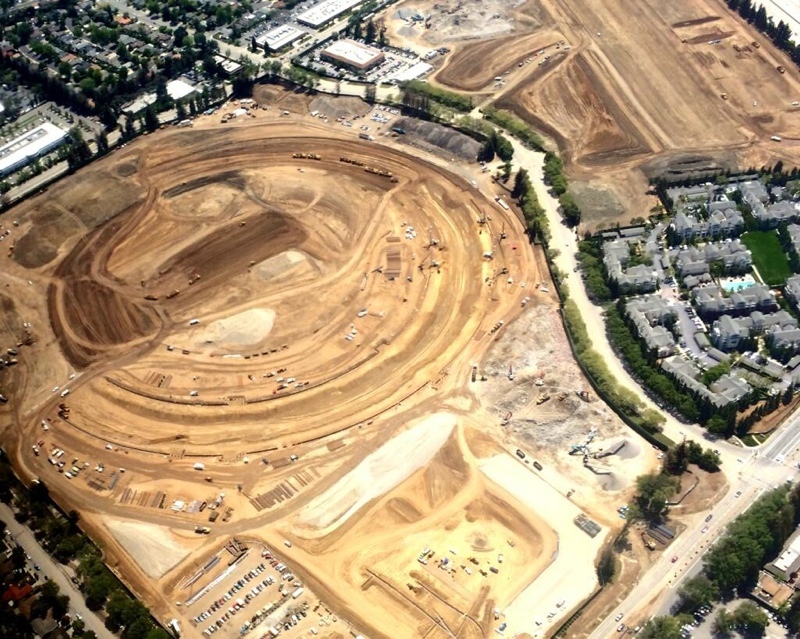 The picture shows an almost blank canvas read to take the giant circular structure, which isn’t too far from Apple’s existing campus (‘Campus 1’). Full permission was granted 6 months ago by Cupertino City Council for what has been dubbed the ‘Spaceship Campus’. The land to be used for the new campus is a mixture of derelict land and existing buildings but this latest photograph shows that the area that will be accommodating the 2.8m square feet building (and resembles a giant donut), is almost ready for construction to begin. Underneath the new building will be parking spaces for nearly two and a half thousand vehicles whilst above ground other impressive features include a 100k square foot gym and an auditorium that is 20% larger than the fitness suite. This innovative building harboring all 13k employees will be 4 storeys tall and cost an estimated $5 billion. Once the main area is completed phase 2 will further building for office space and research and development, as well as further parking. The green credentials will play a large part in this new futuristic campus with plenty of open green space factored in (around 80% of the campus footprint), several water features, sympathetic yet modern landscaping, tree planting and of course all the latest in renewable energy harvesting and green technology. The plans have already been amended slightly to include slightly more parking and spaces for the general public, as well as alterations to cycle and foot paths to facilitate moving around the campus. Inevitably in projects this size more changes are expected but these will undoubtedly fade into insignificance under the shadow of what will be Apple’s new innovation center. Phase 1 (the ‘spaceship’) is expected to be completed in 2016 with phase 2 to follows a couple of years later. Of course, keep watching this space for all the latest news and developments in Apple’s space program!